My regular job involves photographing a lot of glamorous women for Man’s World magazine. I meet many of these women for the first time at the photo shoot and I find music to be a great ice-breaker more often than not, progressing to swapping our iPods back and forth to find music best suited to the mood. So, over the past few shoots, for review purposes, I have been carting the recently launched Logitech AudioStation and my iPod. 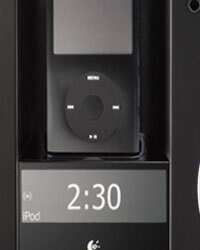 The AudioStation is all black, which is a change from the plethora of white iPod speaker systems we normally see. Behind the mesh, speaker panels hide four speaker drivers: left and right one-inch tweeters and left and right four-inch woofers and the total power for the AudioStation is a whopping—for a desktop system—80 watts. All this is, of course, at a steep price of Rs20,995. The speaker grilles are removable and the system looks so much better with the exposed speaker drivers surrounded by a smooth, silver bezel. Right in the centre is the iPod dock which uses Apple’s Universal design and charges your iPod while docked (eight dock adapters are included for accommodating most dockable iPods). A large, backlit LCD display with big, easy-to-read characters, different brightness levels and seven touch-sensitive, backlit buttons on a gloss-black panel provide an understated but attractive appearance. At the back of the AudioStation, an audio cable connects to a brick-like external power supply. Also provided is a stereo auxiliary-input mini-jack for listening to a non-iPod audio source, composite and S-video output jacks for watching video and photos hosted on capable iPods, and AM and FM antenna connectors. A surprising omission is the lack of a data port for syncing your iPod with your computer. The non-iPod brigade will miss out on many of the AudioStation’s most useful features, but it’s still possible to use the speakers via the 3.5mm input. The AudioStation’s backlit display is clear and large enough to view from a good distance. And that’s important, because much of the AudioStation’s functionality is accessed through this screen. The AudioStation provides a large, easy-to-read clock that doesn’t include an alarm function, an odd omission that prevents it from making the transition from the studio to my bedroom. You can replicate the alarm function by setting the alarm clock on your iPod, as the AudioStation will automatically turn itself on when your iPod starts playing, but doing so is rather cumbersome. The overall radio performance is decent and the AudioStation’s FM tuner pulls in a clear, static-free signal. The AudioStation’s remote is quite large and the remote is comfortable to hold and the buttons easy to press. Unfortunately, the remote’s lack of iPod controls means you actually have to press through the menus on the iPod itself, even when it’s docked. The AudioStation also sports its own bass and treble controls, so you can forgo the iPod’s EQ and adjust the sound to your preference directly, a capability one would expect on systems at this price point. The AudioStation is a stand-out one-piece speaker system that I’ve heard. It offers very good detail and good midrange along with better bass response than any similar system. The ability to adjust treble and bass levels meant I could further tailor the sound, although the 3D Stereo mode doesn’t offer any dramatic improvement in stereo separation. At higher volume levels—in the Apple iPod Hi-Fi territory—Logitech’s speaker sounds great and remarkably distortion-free. It’s loud enough to fill a cavernous studio with music. One-piece, desktop speaker systems will never sound as good as a quality set of home computer speakers with a subwoofer and satellites, especially in terms of stereo imaging and bass response. In the case of speakers such as the AudioStation, you’re paying a premium for the ease of use, space-saving design, and “movability" that such a system brings. If you need or appreciate these attributes, you’ll likely find the AudioStation worth paying for as it certainly holds its own in terms of style and sound quality among its ilk.